Embroidery Beginner – where do I start? Having a hobby is important. Not only is it a great way to pass time, but it also improves your emotional and mental well being. Having a hobby can improve your confidence, self-esteem and reduces the negativity that you may have in your life. Embroidery is the art of decorating patterns on different types of fabric with a needle and thread. It can be challenging at first, but the more you do it, the easier it becomes and you have the option of buying kits which guide you through the process, making it much easier to learn. It provides you with all the material and threads that you need and want. 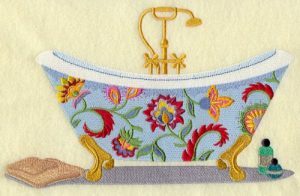 Embroidery gives you the opportunity to make your own unique designs and you can send these to a friend or a relative as a gift, or you can put them around your house and show off your creativity to your guests. For example, you could make a design for a hat, blanket or even a dress. When you think of embroidery, you think that only grandparents would do it. That might have been true in the old days, when they would make their own clothes and clothes for their children or grandchildren, but that is not the case anymore. You see people of all ages enjoying it, and it is no longer a stereotype. If you are suffering from an addiction and need to do something with your hands all the time, then this might be a good option for you. It is also a good choice if you are suffering from a long-term mental illness, such as depression. It takes your mind off all the negative thoughts and turns this negativity into positivity! Don’t be scared of giving this a go, as you will never know whether you will enjoy it or not if you don’t try it.